Summer time is Rose time. Chris and I really enjoy drinking Rose. We especially like drinking Rose at the lake. I love putting the boat in drive, slowly following the lake shore and looking at everyone’s homes. Drinking a Rose in the heat is like drinking Kool-aid for me. The cool wine quenches my thirst. I tend to like lower alcohol Rose so I can drink more. When we are on the lake I cannot and do not drink heavy. With the lower alcohol wine I can drink more and pace myself. The four Rose below are just a few that we have dried over the summer. If you have a favorite please send me an email. I would love to give it a try next year. 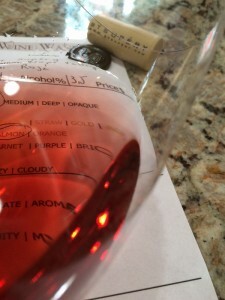 With the unofficial end of summer Labor day weekend we tend to slow down on the Rose’ and focus more on Chardonnay’s and interesting white blends. There are a few new South African white blends I have tried and purchased that are very affordable. Here’s to the changing season. We love fall but are not fans of winter. Pale color depth with a red hue. 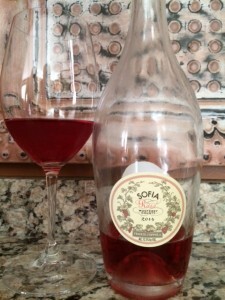 Moderate, young-fruity with aromas of strawberry, pomegranate and raspberry. Dry, light-bodied with balanced acidity. Crisp bright mid-palate flavors with a medium length finish. 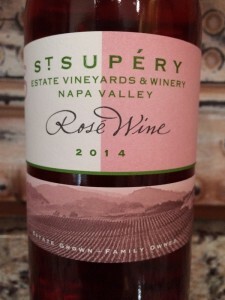 I rated the 2014 St. Supéry Estate Vineyards & Winery Rose three glasses. Pale color depth with an orange hue. Aromatic, young-fruity with aromas of raspberry and strawberry. 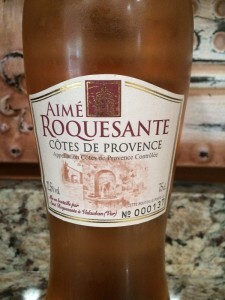 I rated the 2014 Aime’ Roquesante Rose’ three glasses. Pale color depth, salmon hue. Aromatic, young-fruity with aromas of strawberry and peach. Dry, light-bodied with excellent acidity. 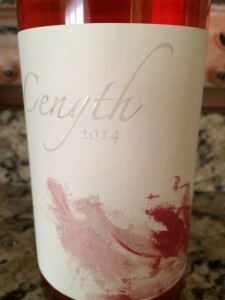 Crisp fruity flavors withe a medium length finish. How much: $15.00 at Costco. 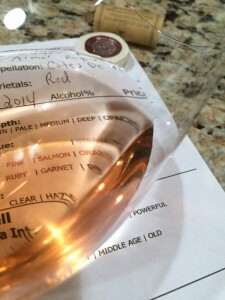 I rated the 2014 Frances Coppola Sofia three glasses. 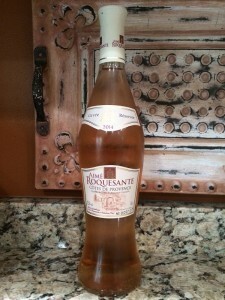 We really enjoyed this one and we drove back to Costo and purchased a couple more bottles. 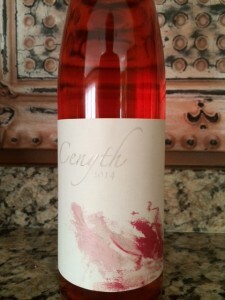 2014 Cenyth Rose of Cabernet Franc. 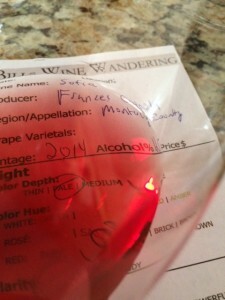 This is the first vintage for a relatively new young female winemaker. Hélène Seillan spent her childhood in both France and California, surrounded by family and friends for whom winemaking was as much a passion as it was a profession. Following in her father’s footsteps, Hélène pursued a career in winemaking and began splitting her time between Sonoma County and Saint-Émilion. Pale color depth with a salmon hue. Initially the wine was too cold (my bad). With it being too cold the Rose was not to aromatic (which I understand). 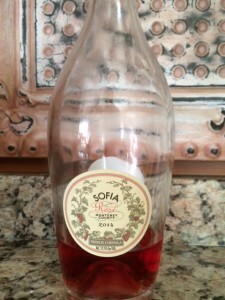 As the Rose warmed up it became aromatic, young-fruity with strawberry aromas. Dry, light-bodied with balanced acidity with a crisp long finish. How much: $20.00 direct from winery. 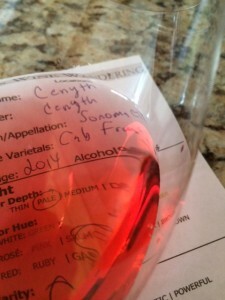 I rated the 2014 Cenyth Rose of Cabernet Franc three glasses. As the Rose warmed up it was very good.